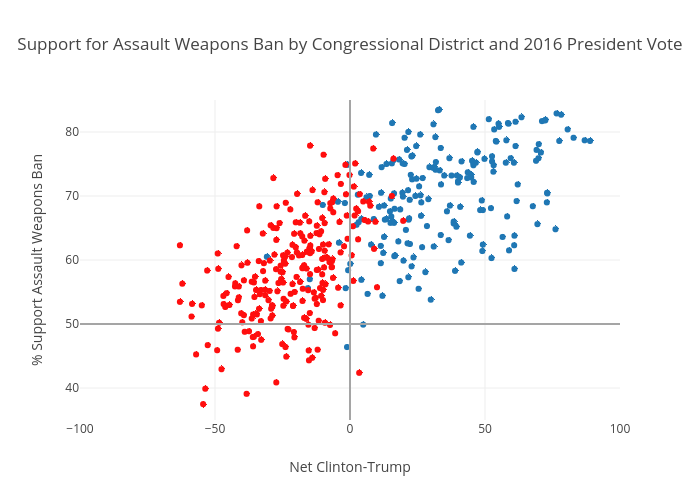 Sjclermont's interactive graph and data of "Support for Assault Weapons Ban by Congressional District and 2016 President Vote" is a scatter chart, showing Dem, y vs GOP, y; with Net Clinton-Trump in the x-axis and % Support Assault Weapons Ban in the y-axis.. The x-axis shows values from -100 to 100. The y-axis shows values from 35 to 85.